As one of Madrid's most emblematic and iconic squares, Plaza de Cibeles has come to be just as much a symbol of the city as Puerta del Sol or Plaza Mayor. The neoclassical square in central Madrid is many things — a major traffic hub, home to a handful of spectacular buildings, even the unofficial headquarters of Spanish soccer victory celebrations — but it also boasts a rich history and cultural heritage. Here's what to know before you go. The story of Plaza de Cibeles dates back to 1777, when the first of its magnificent buildings — the Buenavista Palace — was constructed. A few years later in 1782, so was the square's current centerpiece, the Cibeles Fountain — however, it was originally located outside the Prado Museum and wasn't moved to the plaza until 1895. 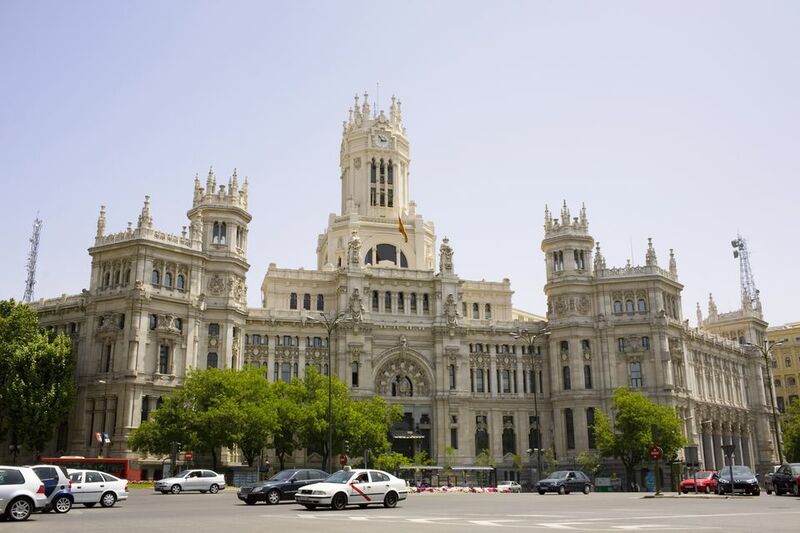 Throughout the next century, the rest of the buildings that decorate Plaza de Cibeles sprung up around the square. The Bank of Spain was completed in 1891, Linares Palace in 1900, and finally the crown jewel of the square — Cibeles Palace itself — in 1919. Plaza de Cibeles's location in the heart of Madrid, at the crossroads of several key neighborhoods and thoroughfares, couldn't be more ideal. Located right at the junction of Calle Alcalá, the northwest corner of Retiro Park, and Paseo del Prado, it's easy to access from nearly anywhere in the city center. Madrid is an easily walkable city, and getting to Plaza de Cibeles on foot from most of the Spanish capital's other major tourist sites isn't too difficult. However, if you'd rather take public transportation, hop on metro line 2 and get off at the Banco de España station. Bus lines 1, 2, 9, 10, 15, 20, 34, 51, 52, 53, 74, 146, 202 and 203 also serve Plaza de Cibeles. Each of the four major buildings surrounding Plaza de Cibeles, as well as the eponymous fountain, claims its own unique story and forms a part of Madrid's rich history. Buenavista Palace: As the oldest building in Plaza de Cibeles, Buenavista Palace has noble roots: it originally served as a home for the Duke and Duchess of Alba. Today, it serves as the headquarters of the Spanish Army. Free guided tours are available, and you can also watch the fascinating changing of the guard here on the last Friday of most months. Cibeles Fountain: The fountain that gave the square its name depicts Cybele (Cibeles in Spanish), the Greek goddess of fertility and nature, seated atop a chariot being pulled by lions. The sculpture's sense of power and might have made it a favorite spot of the Real Madrid soccer team as well as Spain's national club, both of whom gather at the fountain with fans to celebrate victories. Bank of Spain: The Banco de España building is the only structure on Plaza de Cibeles that still serves its original purpose. The exterior façade is impressive, but inside, the building houses several artistic masterpieces by the likes of Goya and other icons. Linares Palace: Located on the northeastern corner of the plaza, Linares Palace served as the home of the noble Linares family in the early 20th century. Over the years, it was restored and eventually reopened as the Casa de América, a cultural center that promotes the art, history and heritage of Latin America through exhibitions, film screenings, discussion panels and more. Cibeles Palace: After its construction in 1919, the most stunning masterpiece of Plaza de Cibeles served as the Palacio de Comunicaciones, or the headquarters of the national postal service (making it arguably the most gorgeous post office the world has ever seen). In 2007, it became Madrid's city hall. There is a rooftop terrace on top of the building offering great drinks, food and views across Madrid's city center. As you may imagine given its fabulous location, there's plenty to see and do in the area surrounding Plaza de Cibeles. Head west and you'll eventually hit Gran Vía, Madrid's most legendary avenue, which gives you easy access to Puerta del Sol as well. Directly south of the plaza lie two of the three iconic museums that make up Madrid's Golden Triangle of Art: the Prado and the Thyssen-Bornemisza. The city's most famous green space, Retiro Park, lies just east of the square. Finally, as you make your way north, you'll find yourself in the posh Salamanca district, home to some of Madrid's best shopping.